Hello blogosphere world! Welcome to todays post. This post is something I’ve wanted to do FOREVER now but haven’t really had the guts to. There still seems to be a stigma around mental health and I want to help us get rid of that. So many people suffer with some sort of mental health problem, there is a whole spectrum and if you fall somewhere on that spectrum that’s fine! I think its time we help those who suffer instead of helping create this stigma and we start talking about mental health! I suffer from anxiety and have done pretty much all my life. The worst days for me are when everything all just seems too much and you aren’t quite sure how to get out of the funk. Todays post will go through the steps I take to make the day that little bit easier. This is the first post of a series I want to do here on KatieBlogsItAll. 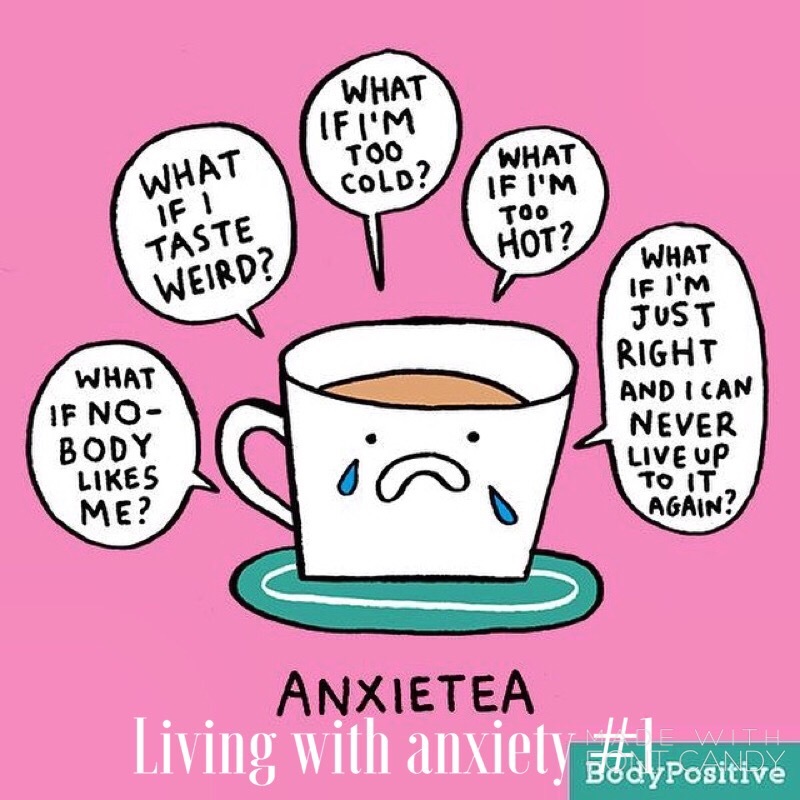 I want to explore all aspects of living with anxiety and how to deal with it in day-to-day life. 20 ways to deal with a bad anxiety day! – Get up! – Make your bed! – I can’t even begin to tell you how many times ive just wanted to stay in bed all day and stew in whatever im feeling that day. But honestly getting up and starting your day gives you that extra push that’s needed when your really feeling out of it and completely out of your daily schedule. Just a small task like getting up and making your bed puts you on your way for all the other small tasks of the day. – Stay away from Caffeine! – Whenever I wake up and feel its going to be a bad day the one thing that is a HUGE indicator is that i tend to get EXHAUSTED! But stay away from the caffeine! Caffeine can cause caffeine and sluggishness and is just overall not a good idea. Meditate/Breathing exercises – Taking some time out of your day preferably as soon as you wake up feeling anxious to go through some meditation and breathing exercises really helps. Pop in some earphones for some guided meditation or just close your eyes and concentrate on your breathing. Keep Hydrated! – Drinking plenty of water keeps you feeling fresh and awake and gets rid of any sluggish feelings. Listen to some calming/relaxing music – I personally have a playlist on Spotify for the days when i really just need to put my headphones in and fade out. Music is my favorite mood changer and relaxing music always helps me calm down. Keep off social media – Keeping away from all social media for the day can help you reset your mind and concentrate on yourself and your own life for the day other than anyone elses. Your own self-care is all that matters on bad days. Take a relaxing bubble bath/Light a candle – On days where you can just chill out go ahead and take a nice long relaxing bubble bath and on days where you may be a little more busy even doing something as small as lighting your favorite candle while you get ready can improve your state of mind. Take an Hour – The ‘take an hour’ method is so important to me. No matter what kind of day your having always take an hour for yourself. Do whatever you would like, chill out and be at one with yourself. Talk! – As soon as you feel a bad day coming on dont bottle it up! Talk to someone, anyone you feel comfortable with about whats going through your head. Just having someone to confide in makes all the difference. And this can help you realise your not alone. Spend time with those you love – Spending time with your loved ones makes you feel loved and being around people can take your mind off anxious thoughts. Being surrounded by friends and family is always nice. Get moving! – Get outside for a walk or do some gentle yoga indoors. It doesn’t matter what you choose to do just make sure you get your body working! Go to your ‘Happy place’ – I usually pair this step up with the listening to calming music step. Lie back and imagine your happy place. Let your mind take you to a whole other world. Wear comfy clothes – A bad anxiety day is bad enough so treat yourself by having a ‘comfy clothes day’ and wear whatever makes you happy/comfortable. Drink a soothing hot drink – A hot drink is perfect for a time out and re group break. Try an herbal tea to really maximise the calming and soothing effects! Drinking something with camomile is also perfect right before bed or anytime you want to chill out. Do something you love – what else will improve your mood more than doing something you love. It could be something as small as binge watching an entire season on Netflix but if it helps you go for it! Write it down – I recommend bullet journalling to anyone with anxiety! Writing down exactly whats in your mind and getting it out onto paper is so soothing. Think about 3 things your grateful for – Either just think of them or write them down. This helps ground you. Sleep – Sometimes my anxiety is brought on my something so small as missed sleep. Getting your 8 hours a night helps your body, soul and mind. Pamper – This falls into taking time out just for you too. Even if it’s just a face mask or a manicure. Concentrate on yourself and your own needs. Organise/Tidy your surroundings – And last but not least we have organising and tidying your surroundings! I don’t know about others but for me when I already feel like my day is chaos and everything is crazy tidying up and having everything neat and organised kinda puts some order back into my life. Just a small spring clean can make you feel centred and calm in your own surroundings. And that was todays post lovelies! Thank you so much for reading a post so important to me! I hope you enjoyed it and please leave some more ideas in the comments! Like i said earlier this is a series so there will be more posts on living with anxiety coming very soon. Once again thanks for reading and ill talk to you all later! Your steps work well with depression too. Sometimes depression and anxiety go hand in hand. They certainly do, very true! Great job Katie. Lots of folks have anxiety, I’m glad we are breaking down the stigma! Thank you! That will be really helpful whenever my little sisters are struggling!